Right. So a couple weeks back I teased the hardware specs of the new storage array I built for the Daisetta Lab at home. My idea was to combine all types of disks -rotational 3.5″ & 2.5″ drives, SSDs, mSATAs, hell, I considered USB- into one tight, well-built storage box for my lab and home data needs. A sort of Storage Ark, if you will; all media types were welcome, but only if they came in twos (for mirroring & Parity sake, of course) and only if they rotated at exactly 7200 RPM and/or leveled their wears evenly across the silica. And onto this unholy motley crue of hard disks I slapped a software architecture that promised to abstract all the typical storage driver, interface, and controller nonsense away, far, far away in fact, to a land where the storage can be mixed, the controllers diverse, and by virtue of the software-definition bits, network & hypervisor agnostic. In short, I wanted to build an agnostic #StorageGlory box in the Daisetta Lab. Right. So what did I use to achieve this? 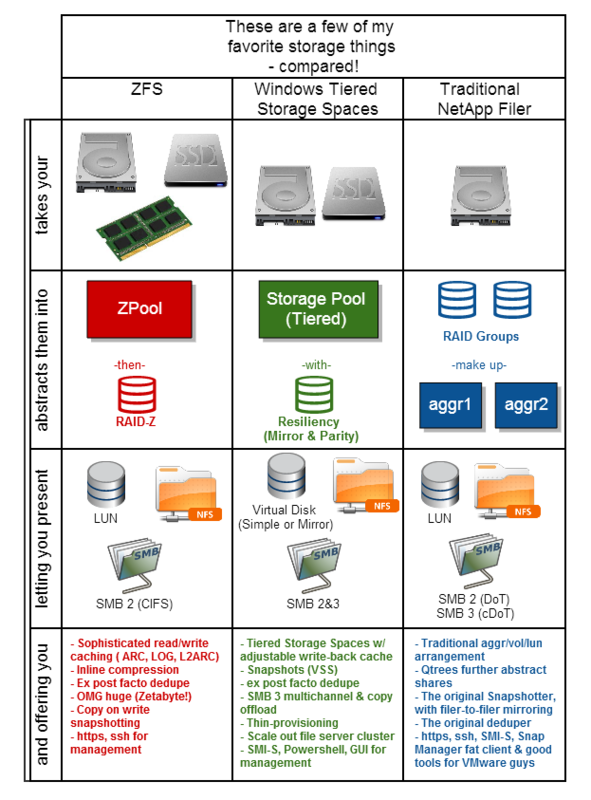 ZFS and Zpools? Hell no, that’s so January. VSAN? Ha! I’m no Chris Wahl. That’s right. Windows. Server 2012 R2 to be specific, running Core + Infrastructure GUI with 8GB of RAM, and some 17TB of raw disk space available to it. And a little technique developed by the ace Microsoft server team called Tiered Storage Spaces. Was a #StorageGlory Achievement Unlocked, or was it a dud? Here’s my review after 30 days on my Windows SAN: san.daisettalabs.net. It doesn’t make you pick a side in either storage or storage-networking: Do you like abstracted pools of storage, managed entirely by software? Put another way, do you hate your RAID controller and crush on your old-school NetApp filer, which seemingly could do everything but object storage? When I say block, do you instinctively say file? Or vice-versa? Well then my friend, have I got a storage system for your lab (and maybe production!) 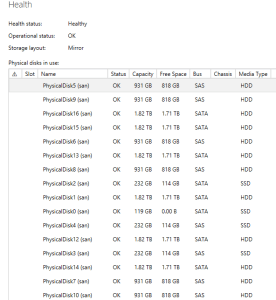 environment: Windows Storage Spaces (now with Tiering!) offers just about everything guys like you or me need in a storage system for lab & home media environments. I love it not just because it’s Microsoft, but also because it doesn’t make me choose between storage & storage-networking paradigms. It’s perhaps the ultimate agnostic storage technology, and I say that as someone who thinks about agnosticism and storage. You know what I’m talking about. Maybe today, you’ll need some block storage for this VM or that particular job. Maybe you’re in a *nix state of mind and want to fiddle with NFS. Or perhaps you’re feeling bold & courageous and decide to try out VMware again, building some datastores on both iSCSI LUNs and NFS shares. Then again, maybe you want to see what SMB 3.0 3.0 is all about, the MS fanboys sure seem to be talking it up. The point is this: I don’t care what your storage fancy is, but for lab-work (which makes for excellence in work-work) you need a storage platform that’s flexible and supportive of as many technologies as possible and is, hopefully, software-defined. And that storage system is -hard to believe I’ll grant you- Windows Server 2012 R2. I love storage and I can’t think of one other storage system -save for maybe NetApp- that let’s me do crazy things like store .vmdks inside of .vhdxs (oh the vIrony! ), use SMB 3 multichannel over the same NICs I’m using for iSCSI traffic, create snapshots & clones just like big filers all while giving me the performance-multiplier benefits of SSDs and caching and a reasonable level of resiliency. File this one under WackWackStorageGloryAchievedWindows boys and girls. 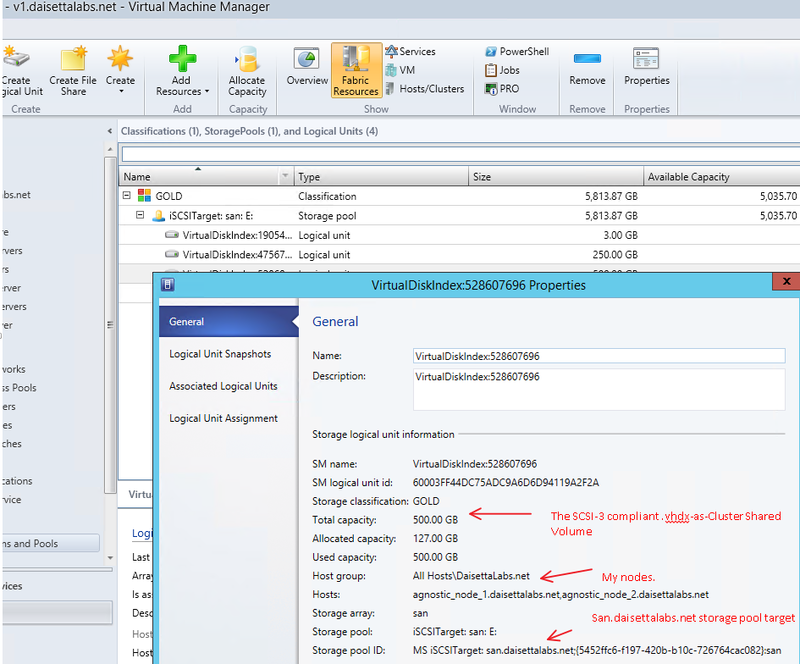 I can do it all with Storage Spaces in 2012 R2. And yes. Ex post facto dedupe is a made up term. By me. It’s latin for “After the fact, dedupe,” because I always scheduled my dedupes for Saturday night, when the IO load on the filer was low. Ex post facto dedupe is in contrast to some newer storage companies that offer inline compression & dedupe, but none of the ones above offer this, sadly. It’s easy to build and supports your disks & controllers: This is a Microsoft product. Which means it’s easy to deploy & build for your average server guy. Mine’s running on a very skinny, re-re-purposed SanDisk Ready Cache SSD. With Windows 2012 R2 server running the Infrastructure Management GUI (no explorer.exe, just Server Manager + your favorite snap-ins), it’s using about 6GB of space on the boot drive. 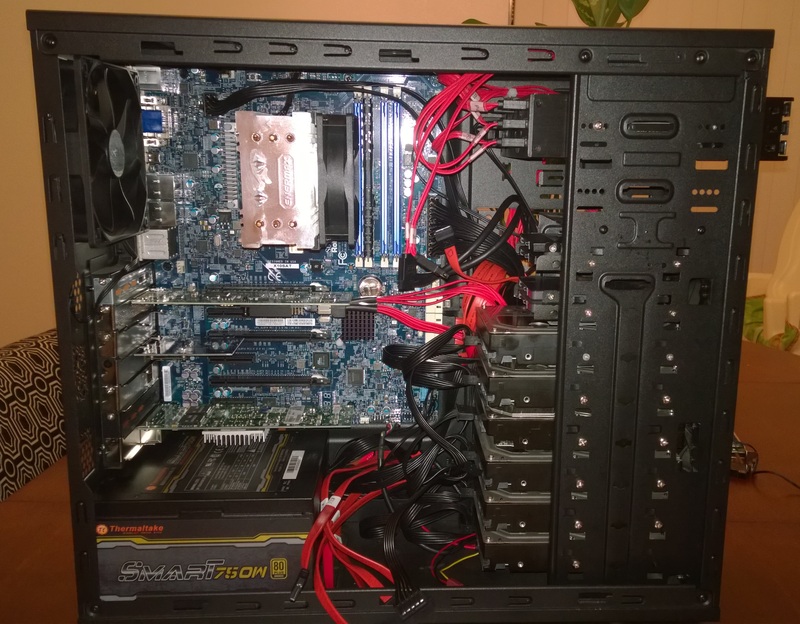 And drivers for the Intel C226 SATA controller, the LSI 9218si SAS card, and the extra ASMedia 1061 controller were all installed automagically by Windows during the build. The only other system that came close to being this easy to install -as a server product- was Oracle Solaris 11.2 Beta. It found, installed drivers for, and exposed all controllers & disks, so I was well on my way to going the ZFS route again, but figured I’d give Windows a chance this time around. Nexenta 4, in contrast, never loaded past the Install Community Edition screen. 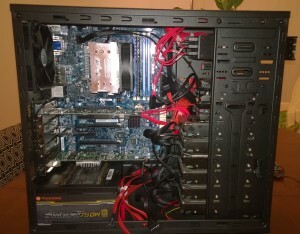 It’s improved a lot over 2012: Storage Spaces almost two years ago now, and I remember playing with it at work a bit. I found it to be a mind-f*** as it was a radically different approach to storage within the Windows server context. I also found it to be slow, dreadfully slow even, and not very survivable. Though it did accept any disk disk I gave it, it didn’t exactly like it when I removed a USB drive during an extended write test. And it didn’t take the disk back at the conclusion of the test either. 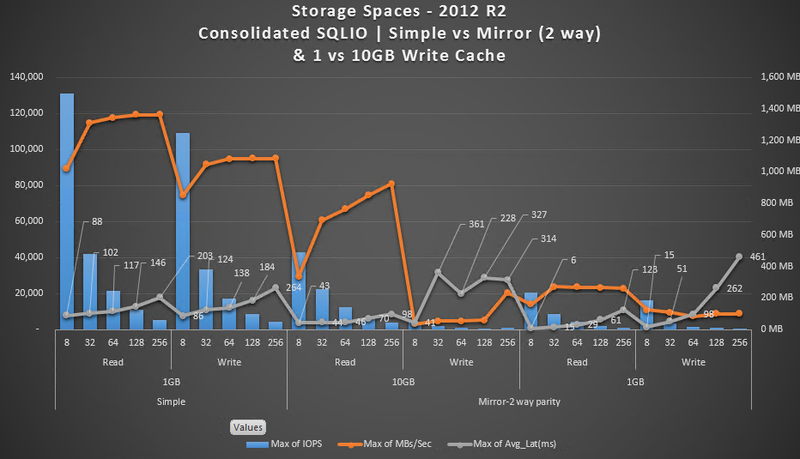 Like everything else in Microsoft’s current generation, Storage Spaces in 2012 R2 is much better, more configurable, easier to monitor, and more tolerant of disk failures. It also has something for the IOPS speedfreak inside all of us. Tiered Storage Spaces & Adjustable write cache: Coming from ZFS & the Adaptive Replacement Cache, the ZFS Intent Log, the SLOG, and L2ARC, I was kind of hooked on the idea of using massive amounts of my ECC RAM to function as a sort of poor-mans NVRAM. 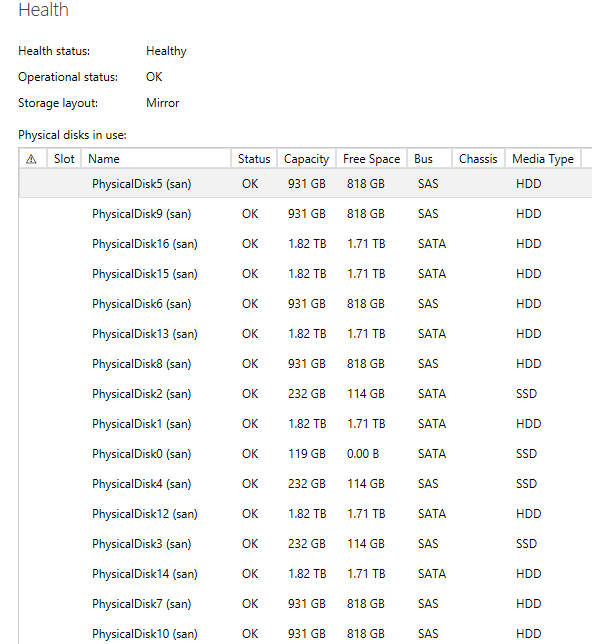 Windows can’t do that, but with Tiered Storage Spaces, you can at least drop a few SSDs in your array (in my case three x 256GB 840 EVO & one 128GB Samsung 830), mix them into your disk pool, and voila! Fast read-cache, with a Microsoft-flavored MRU/LFU algorithm of some type keeping your hottest data on the fastest disks and your old data on the cheep ‘n deep rotationals. What’s more, going with Tiered Storage Spaces gives you a modest 1GB write cache, but as I found out, you can increase that up to 10GB. Which i naturally did while building this guy out. I mean, who wouldn’t want more write-cache? But there’s a huge gotcha buried in the Technet and blogposts I found about this. I wanted to pool all my disks together into as large of a single virtual disk as possible, then pack iSCSI-connected .vhdxs, SMB 3 shares, and more inside that single, durable & tiered virtual disk.What I didn’t want was several virtual disks (it helped me to think of virtual disks as a sort of Aggregate) with SMB 3 shares and vhdx files stored haphazardly between them. Which is what you get when you adjust the write-cache size. Recall that I have a capacity of about 17TB raw among all my disks. Building a storage pool, then a virtual disk with a 10GB write cache gave me a tiered virtual disk with a maximum size of about 965GB. More on that below. It can be wicked fast, but so is RAID 0: Check out my standard SQLIO benchmark routine, which I run against all storage technologies that come my way. The 1.5 hour test is by no means comprehensive -and I’m not saying the IOPS counter is accurate at all (showing max values across all tests by the way)- but I like this test because it lets me kick the tires on my array, take her out for a spin, and see how she handles. What’s odd is how poorly the array performed with 10GB of “Write Cache.” Not sure what happened here, but as you can see, latency spiked higher during the 10GB write cache write phase of the test than just about every other test segment. Something to do with parity no doubt. For my lab & home storage needs, I settled on a Mirror 2-way parity setup that gives me moderate performance with durability in mind, though not much as you’ll see below. Making the most of my lab/home network and my NICs: Recall that I have six GbE NICs on this box. Two are built into the Supermicro board itself (Intel), and the other four come by way of a quad-port Intel I350-T4 server NIC. Anytime you’re planning to do a Microsoft cluster in the 1GbE world, you need lots of NICs. It’s a bit of a crutch in some respects, especially in iSCSI. Typically you VLAN off each iSCSI NIC for your Hyper-V hosts and those NICs do one thing and one thing only: iSCSI, or Live Migration, or CSV etc. Feels wasteful. But on my new storage box at home, I can use them for double-duty: iSCSI (or LM/CSV) as well as SMB 3. Yes! Usually I turn off Client for Microsoft Networks (the SMB file sharing toggle in NIC properties) on each dedicated NIC (or vEthernet), but since I want my file cake & my block cake at the same time, I decided to turn SMB on on all iSCSI vEthernet adapters (from the physical & virtual hosts) and leave SMB on the iSCSI NICs on san.daisettalabs.net as well. That’s five, count ’em five NICs (or discrete channels, more specifically) I can use to fully soak in the goodness that is SMB 3 multichannel, with the cost of only a slightly unsettling epistemological question about whether iSCSI NICs are truly iSCSI if they’re doing file storage protocols. Now SMB 3 is so transparent (on by default) you almost forget that you can configure it, but there’s quite a few ways to adjust file share performance. Aidan Finn argues for constraining SMB 3 to certain NICs, while Jose Barreto details how multichannel works on standalone physical NICs, a pair in a team, and multiple teams of NICs. I haven’t decided which model to follow (though on san.daisettalabs.net, I’m not going to change anything or use Converged switching…it’s just storage), but SMB 3 is really exciting and it’s great that with Storage Spaces, you can have high performance file & block storage. I’ve hit 420MB/sec on synchronous file copies from san to host and back again. Outstanding! SMI-S, which is awesome for Virtual Machine Manager fans: SMI-S, you’re thinking, what the the hell is that? Well, it’s a standardized framework for communicating block storage information between your storage array and whatever interface you use to manage & deploy resources on your array. Developed by no less an august body than the Storage Networking Industry Association (SNIA), it’s one of those “standards” that seem like a good idea, but you can’t find it much in the wild as it were. I’ve used SMI-S against a NetApp Filer (in the Classic DoT days, not sure if it works against cDoT) but your Nimbles, your Pures, and other new players in the market get the same funny look on their face when you ask them if they support SMI-S.
“Is that a vCenter thing?” they ask. Microsoft, to its credit, does. Right on Windows Server. It’s a simple feature you install and two or three powershell commands later, you can point Virtual Machine Manager at it and voila! Provision, delete, resize, and classify iSCSI LUNS on your Windows SAN, just like the big boys do (probably) in Azure, only here, we’re totally enjoying the use of our corpulent.vhdx drives, whereas in Azure, for some reason, they’re still stuck on .vhds like rookies. Haha! 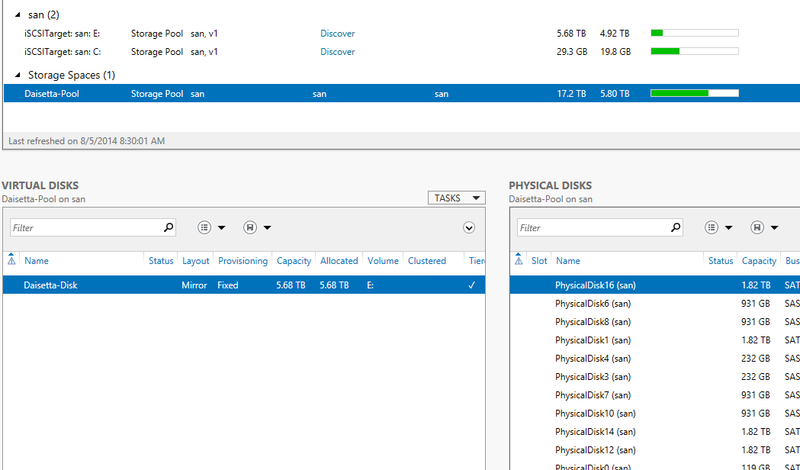 It’s a very stable storage platform for Microsoft Clustering: I’ve built a lot of Microsoft Hyper-V clusters. A lot. More than half a dozen in production, and probably three times that in dev or lab environments, so it’s like second nature to me. Stable storage & networking are not just important factors in Microsoft clusters, they are the only factors. So how is it building out a Hyper-V cluster atop a Windows SAN? It’s the same, and different at the same time, but, unlike so many other cluster builds, I passed the validation test on the first attempt with green check marks everywhere. And weeks have gone by without a single error in the Failover Clustering snap-in; it’s great. It’s expensive and seemingly not as redundant as other storage tech: When you build your storage pool out of offlined disks, your first choice is going to involve (just like other storage abstraction platforms) disk redundancy. Microsoft makes it simple, but doesn’t really tell you the cost of that redundancy until later in the process. For much of the last year, I’ve been using ZFS & RAIDZ2 on the set of six WD Red 2.5″ drives. Those have a raw capacity of 6TB. In RAIDZ2 (roughly analogous to RAID 6), I recall getting about 4.2TB usable. All in all, traditional RAID & ZFS’ RAIDZ cost me between 12% and 35% of my capacity respectively. Ack! With 17TB of raw storage, I get about 5.7TB usable, a cost of about 66%! And for that, what kind of resieliency do I get? I sure as hell can’t pull two disks simultaneously, as I did live during prod in my ZFS box. I can suffer the loss of only a single disk. And even then, other Windows bloggers point to some pain as the array tries to adjust. Now, I’m not the brightest on RAID & parity and such, so perhaps there’s a more resilient, less costly way to use Storage Spaces with Tiering, but wow…this strikes me as a lot of wasted disk. Not as easy to de-abstract the storage: When a disk array is under load, one of my favorite things to do is watch how the IO hits the physical elements in the array. Modern disk arrays make what your disks are doing abstract, almost invisible, but to truly understand how these things work, sometimes you just want the modern equivalent of lun stats. In this Gifcam, watch ada0-6 as they struggle under load with the “Always Sync” option enabled. As best as I can tell, there’s no live powershell equivalent to gstat for Storage Spaces. There are teases though; you can query your disks, get their SMART vitals, and more, but peeling away the onion layers and actually watching how Windows handles your IO would make Storage Spaces the total package. So that’s about it: this is the best storage box I’ve built in the Daisetta Lab. No regrets going with Windows. The platform is mature, stable, offers very good performance, and decent resiliency, if at a high disk cost. I’m so impressed I’ve checked my Windows SAN skepticism at the door and would run this in a production environment at a small/medium business (clustered, in the Scaled Out File Server role). Cost-wise, it’s a bargain. Check out this array: it’s the same exact Hardware a certain upstart Storage vendor I like (that rhymes with Gymbal Porridge) sells, but for a lot less! #StorageGlory achieved. At home. In my garage.